Burger 21 had been mentioned to me by several different folks – one day I even found a newspaper article about it in my inbox when I got to the office – over the last couple of weeks, but no one had been there yet. Today I went to see what they were talking about. 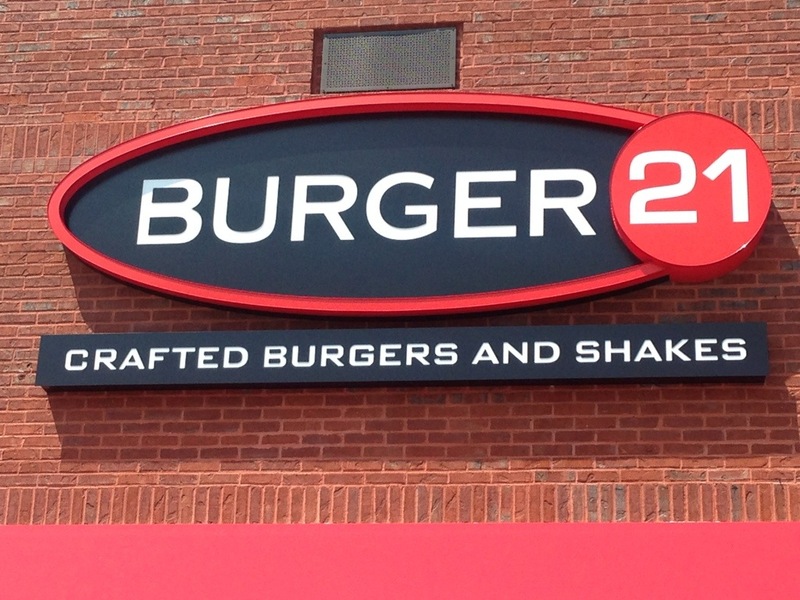 As a new entrant to the Atlanta burger scene (they opened on July 21 – a little over a month ago), this is the first Georgia location for this Florida- based chain (owned by the Melting Pot Restaurants, Inc). But they’re looking to grow – there’s even information on how to become a franchisee on the cups. It’s the kind of place where you step up to the counter, place your order, they give you a number, you take a seat and they deliver your food. This view from the line gives an overview of the restaurant – long and fairly skinny (it is in a strip mall) with a bar on the right wall. 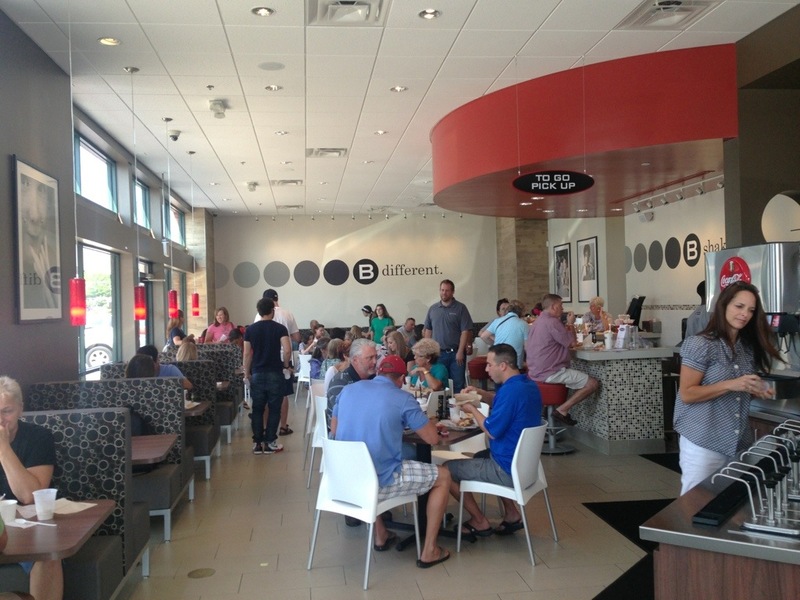 Note: you can’t take a seat at the bar and order – it’s just extra (poorly designed) seating. 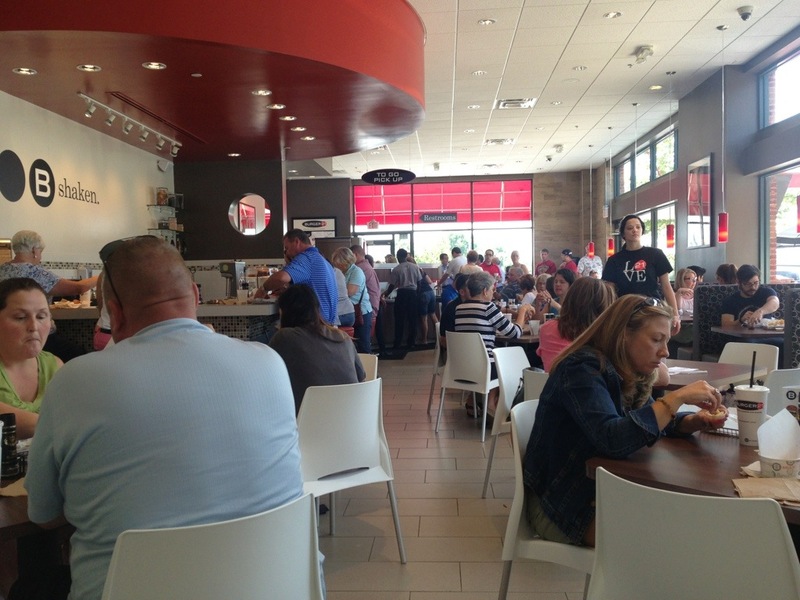 One of the biggest issues with counter-based ordering is you have no control over restaurant seating – which led to a traffic jam of people who had ordered and who had no place to sit. There were people who didn’t understand the concept, sitting at tables, waiting for a server and there were others staking out their real estate like they would a parking place at the mall on Christmas Eve. They do offer outdoor seating, however on a ninety plus degree day, I had no intention of availing myself of that. there are too many tables in the space. How close were the tables? The toddler sitting at the table to my right kept reaching for my fries (he could almost reach them) and the floor space between my table and the table to the left was three quarters filled with a baby in a car seat. And one more thing on the design – there’s work that needs to be done at the condiment bar. where the woman in the white pants is standing in the second photo. Like everything else in the restaurant, the space is beautifully designed – it just doesn’t flow. They assume you’ll walk from the order counter all the way to the other end of the condiment bar, fill your cup with ice and drink, then stop and get a top and straw, then get napkins, then get a plastic cup out of an impossible dispenser to squeeze one of the twelve sauces into it. After about ten minutes, my burger arrived. 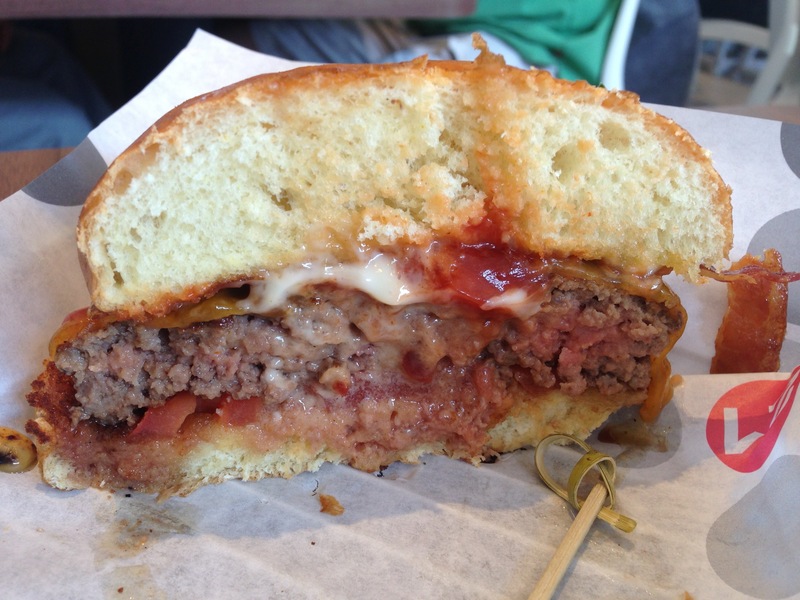 On to the good, the burger was excellent – true medium and so juicy that you needed one of those hard-to-get-to napkins after every bite. 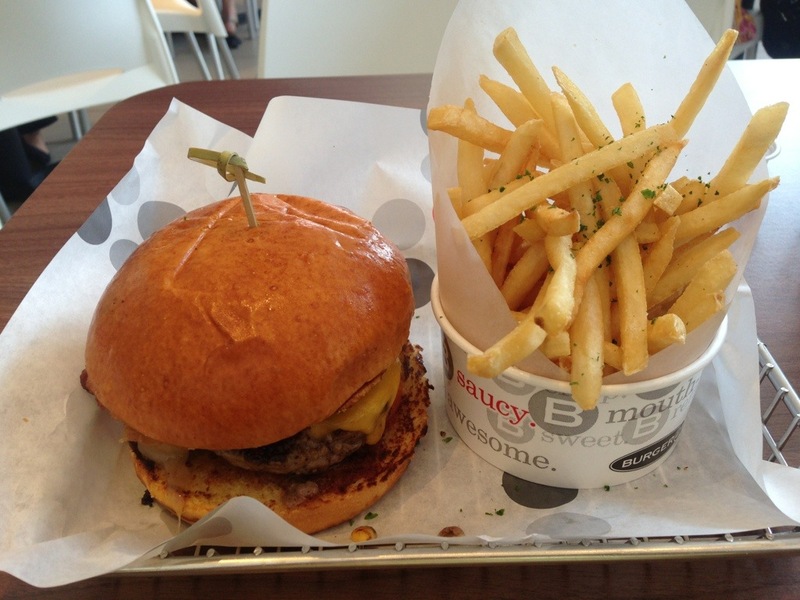 The burgers are made with fresh 100% certified Angus beef and it tasted wonderful. The cheddar was just cheesy enough. (They also offer seafood, veggie, chicken and turkey burgers, along with hot dogs and salads – and they have quite a gluten free menu.) The fries were thin and crispy, very much like steak and shake fries, with little bits of green something or the other on the top. The fries weren’t multitudinous, filling for one but definitely not shareable. Pricewise, it was on the high side. A bacon cheeseburger, fries, and a soft drink were $13 and change. You can’t compare it to fast food, because it was much better than that, but it is comparable to Smashburger, conceptually and taste-wise. According to Smashburger’s on line menu, the same meal would have been $3.00 cheaper. Was it a great experience? No. If I go back it will be either 1) nowhere near a meal time (or the holidays since it is right at the mall or 2) when it’s appropriate weather to sit outside. Was it a great value? No. I’ve got to get out of this habit of double digit lunches. Was it a great burger? Absolutely. But I just don’t know if it was great “enough” to outweigh the negatives.